This world is very different from others in that all scenes are music sequences. It is made up entirely of rhythm mini-games, all of which are optional. Clear the tutorial to get a hang of the timing before starting. Swim This Way Default Get four consecutive Excellents. Part of Your World Defeat Oogie Boogie in Halloween Town. Perform at least five Excellent combos. Under the Sea Defeat the Hostile Program in Space Paranoids. Have the mermaid icon reach the top of the bar. Press only when you see Ariel; ignore Sebastian. Ursula's Revenge Defeat the Grim Reaper in Port Royal. Ursula's health gauge must be equal to or less than 25%. Sora receives the Mysterious Abyss Keyblade as a reward for defeating Ursula. A New Day is Dawning Defeat the Groundshaker in the Pride Lands. Earn at least 30,000 points. 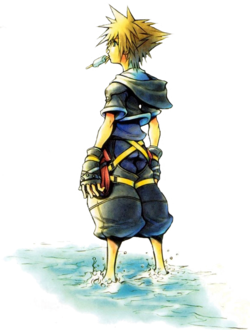 Sora receives an upgrade in his Blizzard magic and Orichalcum+ as a reward for clearing the world. This page was last edited on 28 September 2017, at 22:33. This page has been accessed 13,634 times.